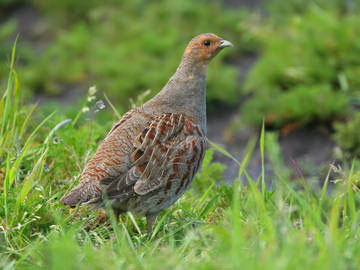 The Grey Partridge is one of the farmland species whose population has crashed in the last quarter-century. Their distribution in the county reflects that decline, and they have been lost from two-thirds of their breeding areas since the First Atlas, down from 420 tetrads to 149. Any species that feeds on weeds, their seeds, and farmland insects will surely have a tough time in an intensifying agricultural régime. The presence of Grey Partridges is easy to detect at dawn or dusk by the far-carrying ‘creaking’ calls, but it is not easy to prove breeding except by finding adults with chicks, which often surprise observers by flying short distances well before they are fully-grown. The nest is well-hidden in long grass, usually under a hedge. During 25 days of incubation the female conscientiously broods her large clutch, averaging 14 eggs, leaving the nest only three times a day, and less often if the weather is wet. This devotion to the nest can carry a heavy price, and up to one-quarter of hens are killed on the nest, mostly at night by foxes. Adults teach their newly-hatched chicks to find invertebrates, especially plant bugs Hemiptera and larvae of sawflies and beetles. Such food forms 80-90% of their intake in the first two weeks of life, as their usual vegetable food provides insufficient nutrition for the energy-intensive early stages of growth: low chick survival has been the key to the species’ decline. The main food of adults and fledged young is seeds, of grasses and most of the broadleaved weeds, with invertebrates taken only incidentally. When they can find them, preferred seeds include Cerastium and Stellaria chickweeds, fat hen Chenopodium spp. and hemp-nettle Galeopsis tetrahit, all of which were recorded as common in the Flora of Cheshire (Newton 1971). On arable land, if available, they favour undersown crops, which contain much higher densities of invertebrates (Shrubb 2003). As expected, observers found most birds on farmland (83% of records), with 24% improved grassland, 12% unimproved grassland, 27% mixed grassland and tilled land and 8% tilled land. Compared to Red-legged Partridge, relatively fewer were recorded on improved grassland, with more on semi-natural grassland (6% of records) and in the edges of scrub (3%). National population indices show a drop of 85% from 1978 to 2004, and there is still no sign of a recovery, despite years of research and the application of a BAP (Aebischer & Ewald 2004). The breeding population of Cheshire and Wirral in 2004-05 was 2,020 birds (650-3,390), an average of about 14 birds per tetrad in which they were present. According to Potts (1986), under modern agriculture, around 4 pairs/ km2 would be expected on optimum ground and 2 pairs/ km2 on suboptimum land, with higher densities expected if suitable management is undertaken. The Cheshire figure is below even the suboptimum density, doubtless owing to the low proportion of arable farming in our predominantly pastoral county. The abundance map shows that the area north of Warrington, where much of Cheshire’s arable farming is concentrated, holds the highest densities of Grey Partridges. Since the polarisation of England into the pastoral west and the arable east, Cheshire can never have been a key county for Grey Partridges, but it is a species being given special conservation effort, under the Farmland Birds LBAP, and it is important that we monitor its local status.